Dry skin occurs due to various factors like cold or less humid weather conditions, less supply of oil to the skin by the oil glands, use of excess make up, exposure to polluted environments, nutrient deficiencies - Vitamins E, A and B, and skin diseases like eczema, dermatitis, or psoriasis. 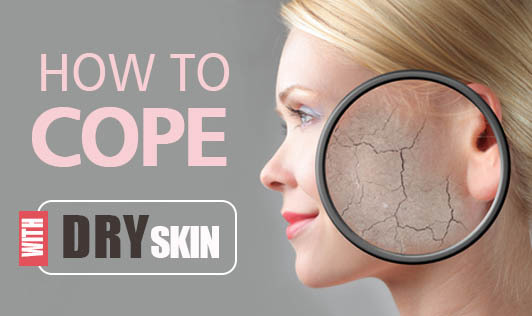 Depending on how dry your skin is, your doctor or dermatologist can help to treat the condition. Use warm water and limit bath time. Hot water and long showers remove oils from your skin. Avoid the over-use of soap. Use a mild soap with a skin-friendly pH value. Pat dry the skin and don't rub. Apply moisturizer, while the skin is still damp. Do not over indulge in sunbathing. Excessive exposure to sun rays can cause dry skin and wrinkles. To reduce irritation, wear light and comfortable clothing made of cotton or silk that suits your skin. Have at least eight to ten glasses of water a day, which will keep the body hydrated and assuage dry skin to a great extent. Massage your skin well with coconut oil or cream every night before going to bed. Use besan flour or powdered oats as a scrubbing agent to exfoliate your skin. Make a face pack of fruits like papaya, peach, banana, mashed avocado etc to give your skin a glowing effect. Lifestyle changes with routine exercises, restricting alcohol and caffeine, quitting smoking, including lots of fruits and vegetables in your diet and practicing a careful dry skin - care routine will not only make your skin radiant and soft, but also instill in you a new sense of confidence and pride.